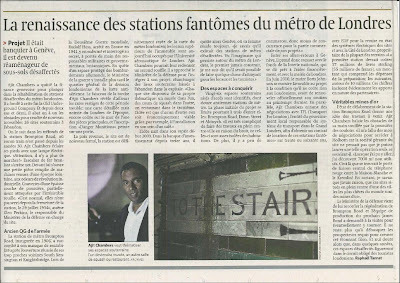 "Ajit Chambers, the Genevan who is reviving the ghost stations of London"
Ajit Chambers left working for a financial organisation in Geneva to dive into the rehabilitation of London's disused Underground stations. He founded for this purpose the Old London Underground Company and has spent two and a half years shooting down 'one by one' the obstacles to make available 26 new abandoned underground sites to benefit London's tourism economy. 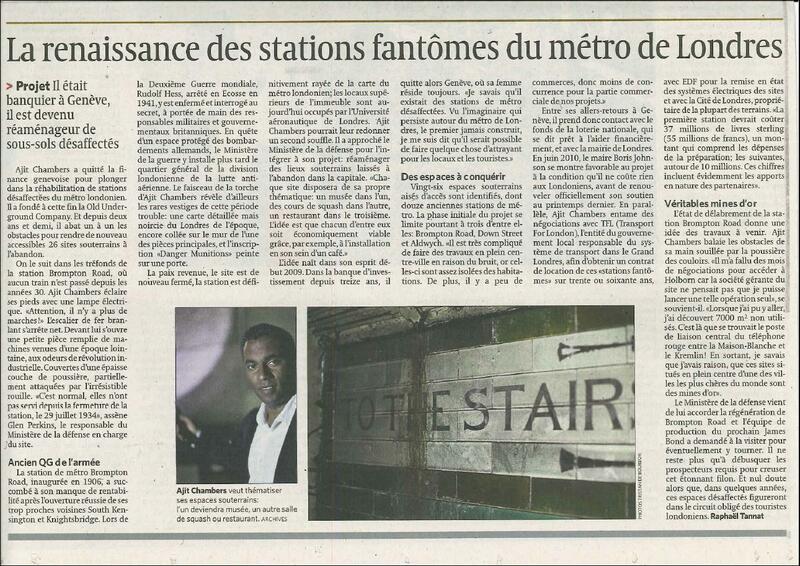 Last week 'Le Temps' followed him in the depths of the Brompton Road station, where no train has passed since the 30's. Between his trips to Geneva he has spent serious time preparing his financial model ready for the worlds investors to see on the 2nd of September. Ajit has also received a pledge from the Mayor of London, Boris Johnson, that the project will go ahead ''as long as it doesnt cost a penny of public money''. The Mayor has regularly renewed his support for the project, notably last spring on BBC Parliament TV in his own office he called Ajit ''A brilliant Gentleman''. In parallel, Ajit Chambers began negotiations with L.U. (London Underground), the local government entity responsible for the transport system in Greater London to obtain leases of these "ghost stations" to create a group of tourist attractions that will benefit London's economy and pay directly back into London Undergrounds budgets. ...then there is no doubt that in a few years, these abandoned spaces will be included in the circuit of every tourist that visits London.